This salad breaks all the rules! The lettuce is cooked, and it is best dressed and left for a few minutes before serving. Taking its inspiration from a Caesar salad, the traditional creamy mayonnaise is replaced with a vinaigrette. 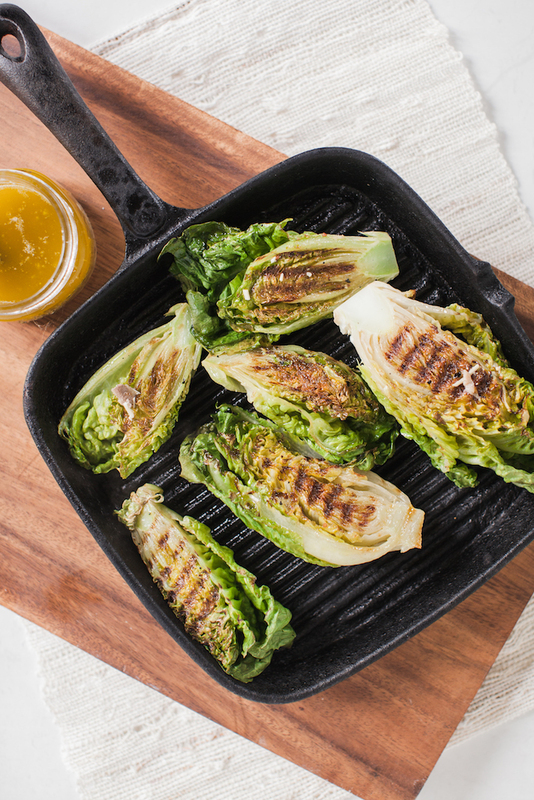 The cos is grilled, something you could do on a BBQ, and then drizzled with the dressing, soaking up the flavours of the lemon and anchovy to accompany the smokiness from the grill. Place all the ingredients in a blender and whizz until combined. Alternatively place in a bowl and use a stick blender. Slice the cos in half and place flat (or cut) side down onto a hot grill. Cook for 3‒4 minutes until charred. Place charred side up on a platter and drizzle with the dressing. Allow to cool before sprinkling over Parmesan. Serve with more dressing on the side.